So, the good folks at WRAL Out and About have put together a “best of” list for people to vote on. It is a lot of things to vote on, so make sure you give yourself some time if you wish to have your virtual voice heard. To be fair, we haven’t been to Clouds Brewing, yet. The other four have no business being on a list of best places for burgers in the Triangle. Thankfully, there is a write in vote. I beg you to please write in Al’s Burger Shack or Mojoe’s Burger Joint. 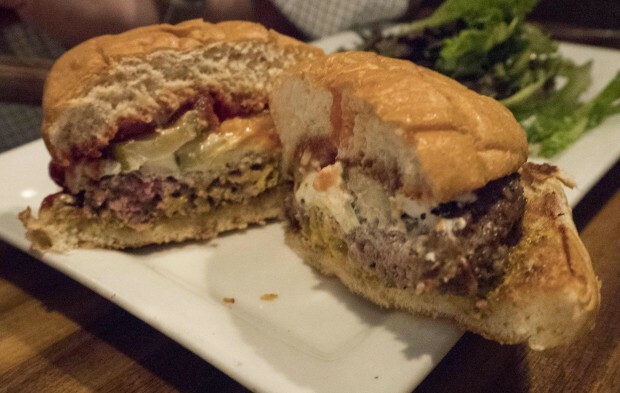 Do not let an average burger establishment be proclaimed as having the area’s best burger. We are better than that, people. We approached The Wooden Nickel with trepidation. If former Mayor Horace H. Johnson is to be believed, downtown Hillsborough was to be a “major disaster” if dens of iniquity like The Wooden Nickel were allowed to serve patrons outside. There would be rampant “lewd licentiousness and debauchery,” a hive of scum and villainy not seen since the Mos Eisley Spaceport. Thankfully, we had a fearless regular of The Nickel, Trey Benfield, to guide us. We asked Trey to give us the skinny on his favorite place to hang out. This is what he had to say. “The Wooden Nickel is my local neighborhood bar and I will freely admit my bias. I go there are least once a week and more if I can help it – but there is a good reason for that. A lot of bars try to pull off the neighborhood bar feel, but rarely accomplish it. I love the fact that I know my bartenders and they know me. They are even happy to see me. Most of the people there are regulars – even the current mayor of Hillsborough is a frequent patron. However, what really sets the Nickel apart is the food. Most bar food struggles to be mediocre. The Nickel takes pride in serving outstanding, creative food with mostly locally sourced ingredients. The quality rivals many nice restaurants. When I first starting going to the Nickel, my wife ordered salmon. I made fun of her for thinking she was going to get decent seafood dish at a bar. I was wrong – it was perfectly pan seared in a way most nice restaurants cannot accomplish. Obviously, the denizens of Hillsborough couldn’t care less for former Mayor Johnson’s warnings. The tiny place was packed to the rafters. Beers and food were flung with reckless abandon. Quite literally in Carolyn’s case as she ended up wearing her cheeseburger. Given that she was 8-months pregnant at the time of our review, she said that ketchup and beer worked well to cool her down a little bit. We’ll focus our review on the special burger for the evening: an 8-ounce burger with white cheddar, bacon, and curry peanut butter. 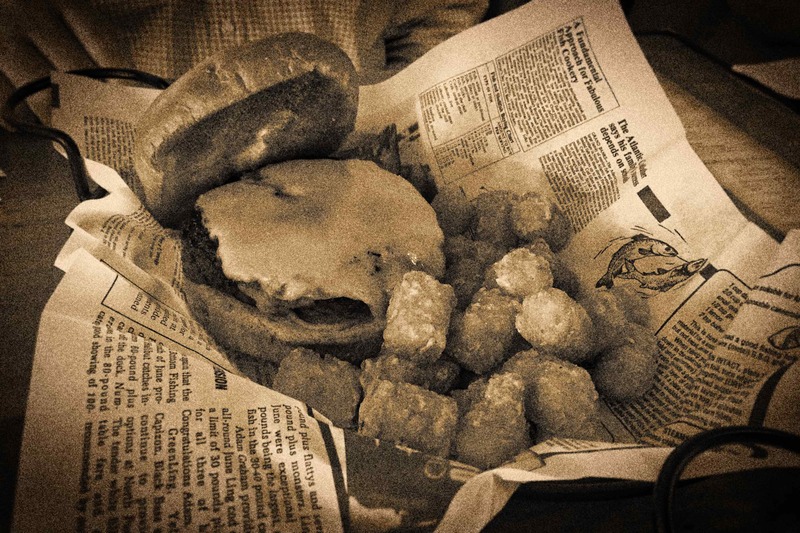 An old favorite of TSB, Salem Street Pub, has a great peanut butter topped burger called “My Wife Said It Wouldn’t Sell.” We figured, local pub, peanut butter on a burger, how can we go wrong? Chad was reminded of a comment he received at a bluegrass jam several years back, “Hey Man, I really like what you’re trying to play.” That fits the vibe we all got from our burgers. It was a really cool idea, and it had its moments, but it didn’t quite deliver. The patty was solid. The bacon was a little limp. The curry peanut butter could have used more time in the blender. A few bites would be peanut butter only then — BAM — a big lump of curry. It was distracting and left the experience somewhat inconsistent. Chad would have given it a 3.5 but he ended up at 3.75 because of the degree of difficulty and the terrific atmosphere. Michael thought the place was charming as hell, but he wished the burger was better. His rating: 3.5. Carolyn gives it a solid 3.5. In 2015, the Oxford English Dictionary, the definitive record of the English language, added the word Meh, an interjection expressing indifference or lack of enthusiasm. It is interesting to note that all three Straight Beef reviewers used the word in their notes on Burger 21. 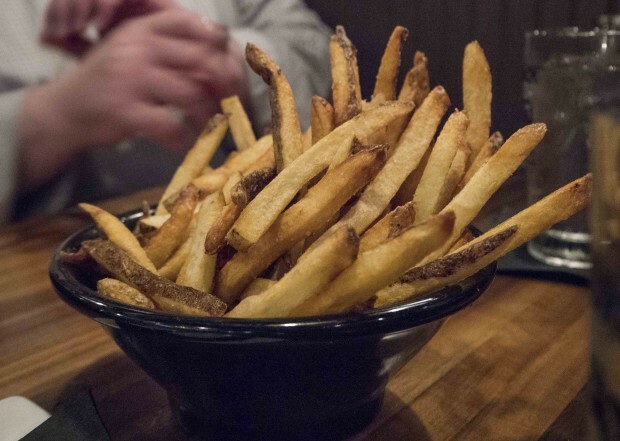 In many ways, Burger 21 is perfectly suited to the town of Cary. It is bland, innocuous, and fiercely determined not to stand out in any way. It is the Little Burger that Could–ish. Mostly. You root for it. You want to see it succeed, but it never quite makes it all the way up the hill. Let’s put it this way, like the little league team that doesn’t play particularly well but still shows up and puts out a modicum of effort, Burger 21 gets a Participation Trophy. As Carolyn noted, “Tellingly, I cannot at this point recall with specificity which burger I had (my magic eight ball thinks perhaps it was the Cinco) but what I do recall is that it wasn’t bad. I remember I liked the bun but have no present recollection of the actual burger beyond generalizations. I remember the milkshake being super tasty and the fries being good with some moderately interesting dipping sauces, but I just don’t remember the burger! For a Tuesday night “crap, what am I going to do for dinner! ?” emergency, swinging by Burger 21 (if it is on your way home) would be totally reasonable. Driving out of your way for it? Meh. Like the DMV, if gets the job done but not prettily or quickly. Michael was more generous with his appraisal, “Upscale burger joints really need to stand out in order to attract customers. Failing that, they need to be in a great location and not be terrible. Burger 21 in Cary stands somewhere in between those. It is in a bustling shopping center in grease splatter distance of a huge apartment complex. My Bacon Cheesy was capably prepared. Don’t take that as damning with faint praise. It was solid and tried to be a great burger. It will keep the locals coming back, but I don’t know if I’d go out of my way to go again. My Burger 21 experience in Tampa was much better. I give Burger 21 in Cary a solid meh. Overall Rating: 3 out of 5, making Burger 21 54 out of 69. 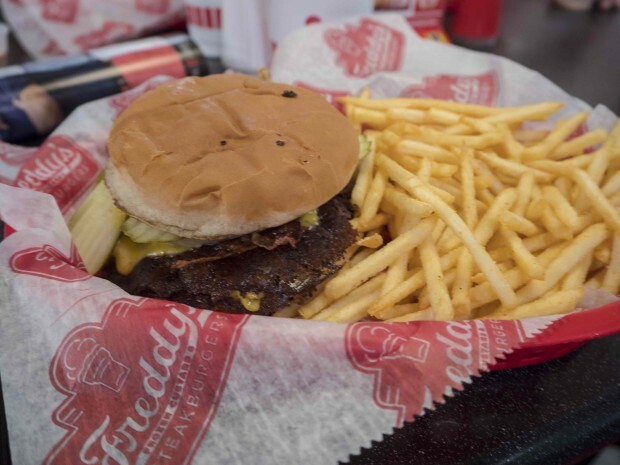 Freddy’s is a throwback, a modern take on the 50’s-60’s diner. A drive in, but only with a drive thru window. It is so Middle America, you half expect to see Richie Cunningham saying “sit on it, Potsie” in the corner booth. So, our intrepid reviewers donned their white tees and poodle skirts and slicked backed their hair to experience Arnold’s, I mean, Freddy’s Frozen Custard and Steakburger, first hand in technicolor in front of a live studio audience. I have never been here – what’s the recommendation? Sit on it, Mikey! I mean what are you going to order? Might I suggest, anything on the menu, this is straight Americana, Boys and Girls. Burgers and Sundae’s? Boy isn’t this place just dreamy. I think I will go with the Bacon and Cheese Double Steakburger. Gee that sounds swell. I think I will go with the Double Steak Burger California Style because if it is California it must be cool, unlike you squares. (laughter) But hold the sauce- you know I don’t dig the sauces. If only you could hold your sauce (mimes someone drinking)… (laughter) I think I will hit up the Original Double. Since I’m a tried and true type of gal, I’m sticking with the original. The double burger gets a double thumbs up and an “Ayyyyy!” There was a skirt of crunchy beef around the edge of the smashed patty, which was cooked to a perfect medium in the center. 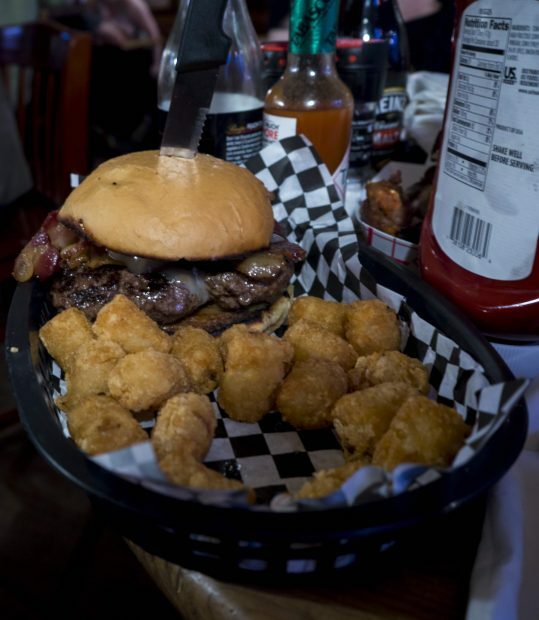 The ultra-thin, ultra-crispy bacon complemented the burger like a poodle skirt and bobby socks. I give this a solid 4.0 and with the addictive skinny fries, the whole experience was almost as good as a drive to Inspiration Point. That’s the only thing that would be going up to Inspiration Point with you! (laughter) I. Found. My. Thrill. On. The bacon cheese double. It gets a 4.0 from me. Yep Yep Yep, that was a good burger. As you said straight Americana. I give it a 4.0, and I give this Chocolate Brownie Delight Sundae my digits, it can call me anytime. I’ve still got it! Full resolution burger photos for Freddy’s can be found over at 500px. My wife and I found ourselves in St. Andrews, Scotland, UK. Our tour guide told us to go to Tailend if we wanted fish and chips. Tailend was listed by the National Fish and Chip Awards (yes, that is a thing) as one of the top 10 places in the UK to get fish and chips. I stared at the menu with a genuine dilemma. Here I am in Scotland. Who knows when I will be able to get back here? The haddock used in the fish and chips was probably caught in the North Sea which was about 300 yards from this restaurant. Yet, there it was, staring at me from the menu. 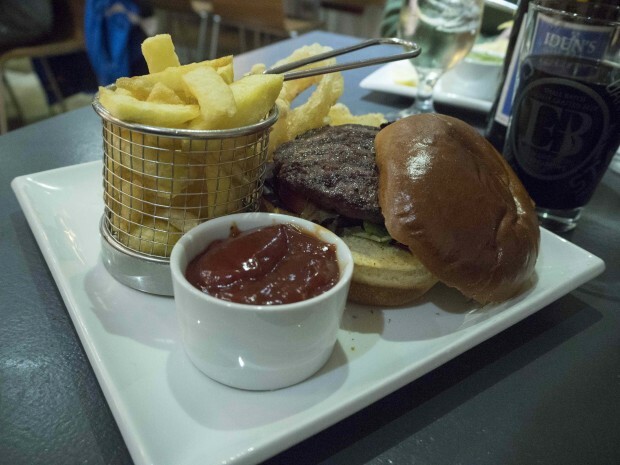 Scotland’s famous burger and chips. I knew I married her for a reason. The medium well patty sat atop arugula and fine onion straws. What I thought was ketchup for the chips was actually the BBQ sauce. The Scots may make tremendous fish and chips, but they don’t know shite about barbecue sauce. At any rate, once I rebuilt the burger with the toppings actually on top and slathered the bun with the spiced ketchup, it was solid. The meat was tasty and fresh but nothing special. I give it a 3.5. If you find yourself at the Tailend, get the fish and chips. Don and Michael look back on 2015 and ahead to what we have in store for 2016. They not only look at what TSB will be in 2016 but the broader market trends. Download our latest episode directly from Libsyn. Subscribe via iTunes or Google Play. You can also find all of our content on the go with the TSB app. 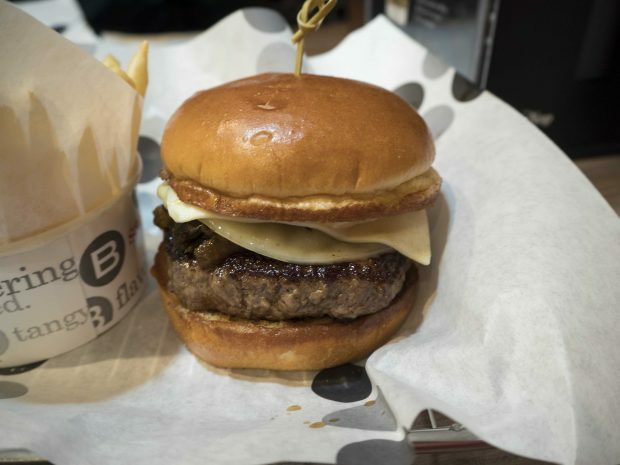 Burger Bach is the latest in the string of high end burger chains that have settled in the Triangle. The gimmick here is their focus on New Zealand beef, lamb, cheeses and honey, all flown in regularly to create the excellent burgers. To which we say, “Hell yes! Screw carbon footprint, screw global warming, this is some damn fine beef!” However, as faithful readers will have already surmised, we know next to nothing about New Zealand. Michael: Crikey! Look at these burgers. Chad: They’re certainly very proud of their condiments. There’s a whole section of the menu devoted to their aioli, free range mayo, organic house-made ketchup, blueberry chipotle BBQ sauce. I stuck with the Basic, the plainest hamburger they make, with ketchup, mustard and pickle (no onions please), and it was so slathered with condiments they started oozing off the burger as soon as I picked it up. They practically squirted out the sides of the bun when I took a bite. It was like they had been applied with a trowel. It was too much to handle I needed to cut this burger. You call that a knife? This is a knife..
Half a burger goes perfectly with a stubby. Carolyn: I got the Aucklander – very good patty cooked medium, with an slightly exorbitant amount of greens on top. The NZ cheese was super tasty although sometimes got lost in the greens. The rest of the toppings got lost amongst the burger and the greens as well, although the combination thereof was delightful. The fries were VERY good, too, although the dipping sauces tended towards being over-garlicked. One large order of fries was more than enough for 4 people. Leave out for dingoes to keep babies safe. Throw another shrimp in the barby, guvnah? Don: Guvnah? That’s wrong on two counts. Plus, yours didn’t have shrimp on it. Michael: I had the East Coast. The blueberry chipotle BBQ sauce, Brie, and bacon? Great combination with the wonderfully beefy patty. Though the bun was dry, what it contained kept this burger in four territory. I don’t quite get the name, though. Burger Bach (Bok)? What is that? Dun dun dun…dun. Don: First of all, it’s Burger Bach (Batch). Second, that’s Beethoven. You’re just making bad Australian jokes. This place is New Zealand themed. The Original was great except there was a conflict between the free range mayonnaise and the Bach sauce to see who could almost over power the burger. It was very close to ruining the feel good vibe that the Bach had going for it. I was quite surprised that the Kiwis were able to put together such a good burger. Now I can be jealous about more than their rugby team. Chad: New Zealand, huh? This burger is my precious. Carolyn: One doesn’t simply walk into Burger Bach. Don: Look. Lord of the Rings was just filmed in New Zealand. It didn’t take place there. I’ve had enough of this. Let’s just get to the ratings. I give it a 4.25. To see more photos from Burger Bach, the full gallery is hosted at 500px. Don and Michael discuss how your burger got to your plate. They go back thousands of years to the beginnings of the domesticated cow. Here are the links we refer to during the episode. Subscribe to the podcast on iTunes or on Google Play. You can also download the episode directly from Libsyn. ANNCR: Dateline: Garner, North Carolina, a burg that knows a good burger! 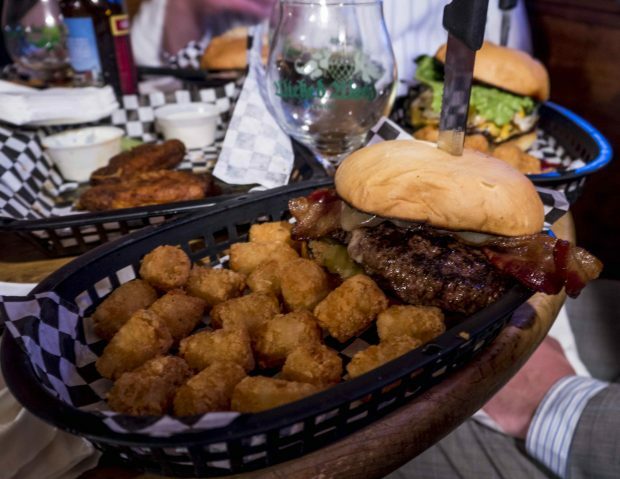 Krafty’s Burger and Brews is a small restaurant and pub with big burger plans. Even before the official grand opening, Burgertone News! was there to bring you the exclusive. 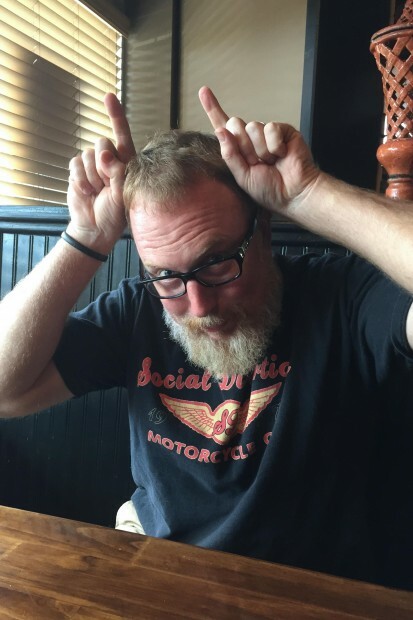 There was a time in this great land where a man would be subject to ridicule if he ordered anything but mustard on his hamburger, and Krafty’s knows it, delivering the Old Fashioned, a hefty half pound of fresh Angus beef adorned with nothing but mustard and the cheese of your choice. This IS your father’s hamburger, and his father’s before that. This is the hamburger that fed the hardworking men and women of America and fueled the nation to greatness. Our reporter’s Old Fashioned burger was expertly cooked to a pink medium with a textbook perfect char on the exterior. ANNCR: The Old Fashioned was marred only by a slightly dry potato roll, a complaint shared by our other correspondents. Krafty’s Old Fashioned is the bee’s knees. It’s the berries, I tell ya. Eminent burgiatrist, Dr. Michael Marino eschewed the Old Fashioned and charged headlong into the future, ordering a hamburger topped with Irish bacon, Guinness barbecue sauce and three onion rings. He not only survived the ordeal but thrived on it. ANNCR: The Reverend Don Corey, a man of the cloth as well as a man of the bun, was equally generous in his praise. ANNCR: There you have it, faithful Burgertone News! fans. You know that you’ll never get anything but The Straight Beef from our reporters. To learn more about Krafty’s Burger & Brews, tune to kraftysburgers.com on your internet dial. Please rise for the Honorable Judge and Burgiatrist in Residence Carolyn McLain. Carolyn: We are here today to hear the arguments of Senior Burgiatrist Michael Marino and Burger Evangelist The Reverend Donald Corey. Before we started, we flipped a patty and Dr. Marino has the honor of presenting his case first. Dr. Marino? Michael: Thank you, your honor. May it please the court. I present to the court that a burger must be made from the ground meat of a formerly living, breathing cow. Now, there are those that will say that chicken, turkey, or even bison are suitable substitutes for a cow burger. Bison are described as more aggressive than the cow. They are wild shaggy creatures. The dirty, hulking hippies, if you will, of the bovine world. Is this the type of animal we want to feed our children? What kind of world is it we live in that we can grind up any meat or vegetable matter and call it a hamburger? I fear for our great nation if we hold the bison burger to the same ethereal level as the glorious cow burger. First it’s bison burgers. Before you know it, it’s Birkenstocks and patchouli. Your honor, I cannot in good conscience call a ground bison sandwich a burger. It is your right as an American to eat whatever you wish. However, never call such a creation a hamburger. Don: Your honor, allow me to present my rebuttal. My esteemed colleague is afraid to admit that the Bison is the noble elegant brother of the cow and, thus, a valid expression of the hamburger. This fear only lessens the chance for you and the world as a whole to experience the heavenly taste of blue skies and undulating fields of natural grasses. Dare I say, the taste of America. Do they not both eat grass? Do they not both have four chambered stomachs? Do they not both chew their own cud? Do they not both travel in herds? And, most importantly, do they not both make great burgers? Your honor, tear down this wall of prejudice and taste freedom. Recognize Bison as the equal to the cow. Carolyn: I am going to retire to West Park Tavern to deliberate over this matter and enjoy an outstanding burger. A beast of a burger. Ten ounces of bison or moo-cow on a brioche bun. Whether it was mooing or grunting in its former life, the results are the same: taste buds getting trampled with flavor. A thick burger cooked to a perfect medium. Crispy bacon, pimento cheese that doesn’t overwhelm or cause structural build issues, a bun that is firm yet yielding. I am still undecided whether a burger made of bison meat should be considered a burger. What I am sure of, though, is that I give the West Park Tavern burger a 4.5 out of 5. Michael’s review: 4.5 out of 5. Don’s Review: 4.5 out of 5.